It actually didn't seem mathematically possible. Three is not a multiple of two, and the computer industry rarely does anything that can't be bundled as a power of two. But AMD's Triple-Core Phenom processor, which will hit desktops at the beginning of next year, may be the oddball that the CPU market never expected. Even folks inside of AMD will admit Intel has stepped up to the plate in the last 16 months, and that AMD has ground to make up in several departments. When Intel was planning its comeback two years ago, it introduced a controversial technique called hyperthreading that enabled a single-core processor to run two threads concurrently. But after tests revealed minimal performance gains - and in some categories, performance losses - many perceived Intel's move as a kind of stopgap, to buy it some time before it could launch its first dual-core series with Core Microarchitecture. With quad-core processors being rolled out already, could AMD be buying some time for itself while retooling its fabs for the 45 nm process and for DDR3 memory support? 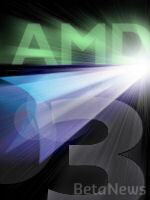 BetaNews posed that question, among others, to Simon Solotko, AMD's brand manager for the Desktop Division. You'll note that, throughout this interview, Solotko tried to elicit some information from us about what we thought about Triple-Core Phenom, at the same time we were eliciting information from him. SCOTT FULTON, BetaNews: Is triple-core a long-term investment for AMD, or is an opportunity you can take advantage of now to punch up the product line a little bit? SIMON SOLOTKO, desktop brand manager, AMD: Well, I think it'll certainly compete extremely well against in-market dual-core products. In general, we will position this product, and I think the market will accept it, above more-or-less all existing dual-core products in-market. And that will be borne out by many of the performance benefits which we'll demonstrate. I think that in general, it's a smart insertion point that has the opportunity, frankly, to help AMD in the space where, over the past twelve months, we've been relatively weak - which is high-end dual-core. We need something to fill that market position - I would call it the $800 - $1000 PC, and I think triple-core, if you just look at current pricing trends, is going to fit nicely there, and it'll be a strong offer from AMD. SCOTT FULTON: So dual-core Athlon then becomes more and more of a value product. SIMON SOLOTKO: Well, does this hasten that, or is that a fact of life already? SCOTT FULTON: I would think nine-tenths of everything in this business is perception. Therefore, in the not too distant future, there could be higher-end dual-core Athlons that are considered mainstream rather than value. SIMON SOLOTKO: Absolutely. The Athlon brand is in many positions being replaced by the AMD Phenom brand. So there's no question that our new brand stack moves Athlon further down in the price band and in its relative positioning. SCOTT FULTON: So we're not seeing a position where, six months from now, there will be a more value-priced Athlon tri-core? Instead, we're going to be moving tri-core down the chain, the Phenom brand is going to be moved along with it? SIMON SOLOTKO: I won't guarantee that. Certainly there are a couple of strategies one could employ with the brand. One is that you tie them to specific widgets, and the other is, you tie them to positions in the market. It's an interesting question, how these things will cascade over time. SCOTT FULTON: Now, is there any kind of possibility for drop-in performance upgrades for system builders and individuals out there who have dual-core AMDs now, who are considering quad-core upgrades and trying to save up - perhaps this triple-core makes an attractive alternative? SIMON SOLOTKO: I think that a lot of the performance benefits associated with quad-core, we're going to see with triple-core, or at least directionally you'll get the same kind of performance scaling. In particular - you tell me what you think - for users who are performance-hungry but price-sensitive (e.g., most normal enthusiasts), in particular in markets like Asia and Europe where people tend to be very well educated and tech-savvy but certainly more budget-conscious, I think that this product could really thread a needle for them. They could say, "Look, I get a huge amount of the performance benefits of basically a step up from dual-core, but at the same time I'm getting it at a better price and it's going to be the right combination of price and performance for me." I think this is an example of offering choice, and I think it's offering choice in a fairly high-performance domain, and as a result, I think that we could see fairly good adoption by cost-sensitive enthusiasts and do-it-yourselfers. SCOTT FULTON: But wouldn't you think that maybe the optimum market for triple-core Phenom then would actually be OEMs and partner companies that are building maybe the sub-$1000 PC as maybe the optimum gift for your going-away [high school] grad, a fairly good performance system without ratcheting up the acceleration all the way? SIMON SOLOTKO: Or the cost. Yea, certainly, and I think certainly in Europe users act that way anyway. They're very smart about these decisions, and I think that they'll say, "Look, I get more than enough benefit, I get a heck of a lot of longevity out of three cores." I think part of AMD's job is going to be making sure that people aren't slapping three- and four-core processors into UMA boxes, right? It is, of course, in our interest and at once consistent with trying to deliver a balanced experience for the end customer, [for us] to encourage right configuration - e.g., more than a non-adequate amount of memory, good performance in hard drives, and a discrete graphics card. And in particular, we think Radeon HD graphics cards with DVD accelerators provide a nice combination of 3D performance and video performance. So if you put together the right elements, you take a three- or four-core system home, many users may not notice a difference, and certainly those users who wouldn't may be best suited to a triple-core product. And I think all users are going to have a really solid experience. I think it's going to be a really, really fast machine when you take it home. Next: How can Triple-Core Phenom compare?